1. John H. James: born circa 1854 in Texas. 2. George William James: born May 25, 1856 in Fannin County, Texas; first marriage September 11, 1879 in Hunt County, Texas to Martha Alice Dorris (1862-1933), daughter of Bennett Dorris and Bethena Wadsworth; possible second marriage on December 19, 1881 in Hunt County, Texas to L.E. Stivers; died June 18, 1901 in Strawn, Palo Pinto County, Texas; buried at Mount Marion Cemetery in Strawn, Palo Pinot County, Texas; known children through Martha Alice Dorris include: Ursula Mae James, Myrtle James, Gentry James, Bessie James, Blanch James, Gertrude James and Earnest George James. 3. Leroy Campbell “Leonard” James: born November 22, 1856 (possibly circa 1858-1859 - See Notes below) in Commerce, Hunt County (possibly Fannin County - See Notes below), Texas; possible first marriage July 18, 1887 in Hunt County, Texas to Minnie Nail; second marriage to Minnie Lee Draper (1875-1953), daughter of Simon Peter Draper and Jemima Haynes; died March 17, 1937 (aged 80) in Mineral Wells, Palo Pinto County, Texas; buried at Elmwood Cemetery in Mineral Wells, Palo Pinto County, Texas; known children include: Clark Hester James, William L. James, Oreta Florence James, Simon Cleo James and Tilman Thurman James. 4. Melinda Alice James: born April 1861 in Texas. 5. Braxton Leftrich James: born January 2, 1864 near Ladonia in Fannin County, Texas; married December 24, 1891 in Hunt County, Texas to Flora Alice Johnson (1812-1960) daughter of Jackson J. Johnson; died August 8, 1923 in Abilene, Taylor County, Texas; buried at Shiloh Cemetery, north of Trent in Jones County, Texas; known children include: Vera Blanch James William Jackson James, Marvin Leftrich James, Ernest Orian James, Flora Agnes James, Manson Leon James, Elizabeth Alice James, Bessie Loraine James, Florence Rachel James and Robert Lee James. 7. Charles M. James: born circa 1868 near Ladonia in Fannin County, Texas; married March 16, 1904 in Hunt County, Texas to Laura Griffis. 8. Richard M. James: born circa 1871 in Texas; married January 1, 1896 in Hunt County, Texas to Dora Allen. 9. Carey Cordelia James: born August 18, 1875 in Texas; died August 23, 1972 (aged 97) in Terrell, Kaufman County, Texas. William George James (1832-1908) was the son of Joel L. James (1811-1875) and Angelina Ryan (1812-1906) of Bedford County, Virginia. John H. James appears in 1860 U.S. Census in Beat No. 4, Fannin County, Texas with family (age 6) but does not appear in any further census reports. George William James (1856-1901) appears in the 1860 U.S. Census in Beat No. 4, Fannin County, Texas with family (age 4); appears in the 1870 U.S. Census in Ladonia, Fannin County, Texas with family (age 14); appears in the 1880 U.S. Census in Precinct 6, Hunt County, Texas as head of household (age 24) and married to Alice James; and appears in the 1900 U.S. Census in Justice Precinct 8, Palo Pinto, Texas as head of household (age 44) married to Alice James. Leroy Campbell “Leonard” James appears in the 1860 U.S. Census in Beat No. 4, Fannin County, Texas with family as “Leroy C.” (age 1). He appears in the 1870 U.S. Census in Ladonia, Fannin County, Texas with family as “Leonard” (age12). He then appears in the 1880 U.S. Census for Precinct No. 6, Hunt County, Texas with family as “Leroy C.” (age 21). 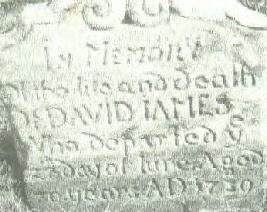 Marriage records at the James Family Archives indicate he was married July 18, 1887 in Hunt County, Texas to Minnie Nail. Melinda Alice James appears in the 1870 U.S. Census in Ladonia, Fannin County, Texas with family (age 9); appears in the 1880 U.S. Census for Precinct No. 6, Hunt County, Texas with family (age 18); and appears in the 1900 U.S. Census for Precinct No. 6, Hunt County, Texas as “Alice” with father only (age 39). Braxton Leftrich James (1864-1923) appears in the 1870 U.S. Census in Ladonia, Fannin County, Texas with family (age 6); appears in the 1880 U.S. Census for Precinct No. 6, Hunt County, Texas with family (age 16); and appears in the 1900 U.S. Census for Precinct No. 6, Hunt County, Texas with wife and children. Florence Theodora James appears in the 1870 U.S. Census in Ladonia, Fannin County, Texas with family (age 4); and appears in the 1880 U.S. Census for Precinct No. 6, Hunt County, Texas with family (age 14). Charles M. James appears in the 1870 U.S. Census in Ladonia, Fannin County, Texas with family (age 1); and appears in the 1880 U.S. Census for Precinct No. 6, Hunt County, Texas with family (age 12). Richard M. James appears in the 1880 U.S. Census for Precinct No. 6, Hunt County, Texas with family (age 9). Carey Cordelia James appears in the 1880 U.S. Census for Precinct No. 6, Hunt County, Texas with family (age 6). 1860 U.S. Federal Census for Beat No. 4, Fannin County, Texas, Household of W.G. James. 1870 U.S. Federal Census for Ladonia, Fannin County, Household of W.G. James. 1880 U.S. Federal Census for Hunt County, Texas, Precinct No. 6, Household of W.G. James. 1900 U.S. Federal Census for Hunt County, Texas, Precinct No. 6, Household of W.G. James. Find A Grave Memorial for Leroy Campbell “Leonard” James (1856-1937), Memorial ID No. 17907488, created by May Ashby Royer, added February 12, 2007. Find A Grave Memorial for Carey Cordelia James (1875-1972), Memorial ID No. 86920666, created by Marty Rutledge, added March 17, 2012. Below is the family of William George James (1832-1908), elder man seated in center, of Bedford County, Virginia and the great, great, great grandson of David James (circa 1660-1739). From left to right, William’s son Braxton Leftrich James (1864-1923) of Fannin County, Texas; daughter-in-law Flora Alice Johnson (1874-1960); granddaughter Flora Agnes James (1900-1982); granddaughter Vera Blanche James (1892-1989); grandson Manson Leon ”Cap” James (1902-1974); daughter Melinda Alice James (adult woman standing in back); granddaughter Elizabeth Alice James (1904-1972); grandson William Jackson “Bill” James (1894-1974); and, grandson Marvin Leftrich James (1895-1969) of Hunt County, Texas. 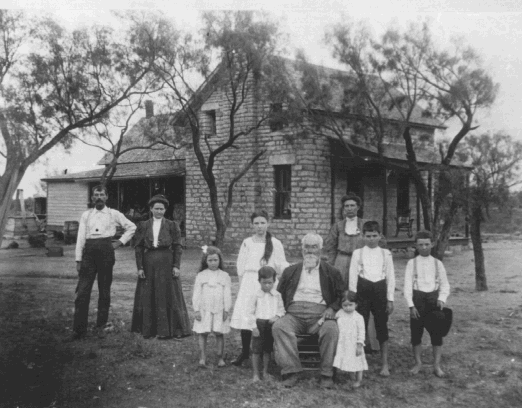 This photo was taken in 1906 in front of the James family home, a.ka., “the old rock house”, located near the town of Trent in Jones County, Texas between the towns of Abilene and Sweetwater.